We have Scag Wildcat Parts! Need parts for your Scag Wildcat! Find them right here at ScagOemParts.com. We have all the OEM Scag Parts for your Wildcat. Blades, Belts, Spindles, Springs, Electric PTO Clutches, whatever you need. Genuine Scag Parts. Fast Shipping! Less Downtime! Order Today. The Scag Wildcat has many full-sized features like a hydraulic oil cooler, dual 10cc hydraulic pumps and a unitized tubular steel main frame. With a low center-of-gravity and wide drive tires, stability is never compromised. The operator friendly design includes"Quick-Fit" control levers, a Soft Ride seat, spacious foot platform, excellent visibility and a convenient instrument panel, providing unmatched comfort and productivity so you can finish the job fast, with beautiful results. The Wildcat incorporates the qualities that helped to frame Scag’s impeccable reputation in the lawn and garden industry. Qualities like durability, comfort, power, and a superior cutting performance. 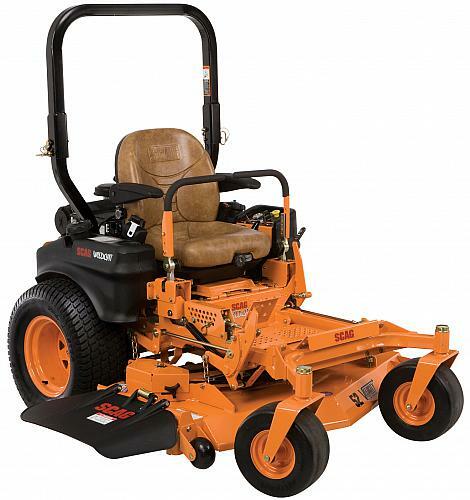 The Wildcat frame is solidly built with heavy-duty tubular steel giving the mower a strong foundation for years of dependable service. Tri-Plate steel makes the top of the Velocity Plus cutter deck nearly ½ inch thick. Quality bearings, all steel pulleys and debris guards on pulley bearings guarantee long dependable service for the idler pulley system. Foremost is the torsion-spring suspension seat. Full padding, high back, forward/rearward adjustment, and adjustable armrests and back angle guarantee superior comfort while on the job. An extra wide footplate along with adjustable Quick-Fit steering control levers compliment the comfortable operating station. The Wildcat is powered by either a Kohler or Kawasaki engine ranging from 25 to 27 HP delivering a ground speed up to 10 mph forward and 4.5 mph reverse. The large 8 gallon fuel capacity allows you to cut all day without refilling. Dual 10cc pumps and high torque cast iron wheel motors ensure dependable, reliable power. A heavy-duty Ogura GT3.5 blade clutch has 250 ft. lbs. of holding strength. The cutter deck and transmission drive system have all-steel pulleys. Scag’s Velocity Plus deck delivers unsurpassed cutting performance even when operated at speeds up to 10 mph. The Velocity Plus deck tops are built with 3 layers of high strength steel for a total thickness of nearly ½” (.485”) thick. Airflow can be adjusted for optimum performance with the patented Custom-Cut Baffle. Scag’s heavy-duty blade spindle shaft is made of a high strength, hardened steel alloy with 1 1/8” diameter. An extra-large discharge opening maximizes the dispersal of grass clippings. When it comes to servicing your Wildcat, use only OEM replacement parts for optimum quality and fit. ScagOEMParts.com has a simple online parts lookup tool to search for parts quickly.